The Agilis is the results of two years of collaboration between the Brownlee brothers and Huub. I finally had the opportunity to try out the new Agilis Huub wetsuit. I was right away really surprised by the quality of this wetsuit. I’ve always found that wetsuits don’t allow you to swim naturally. Because you float better in a wetsuit, they are typically faster than swimming without one. However, you usually have to change your technique slightly because you can’t move your shoulders freely. However, with the Agilis, I was shocked that I could swim without having to change my technique at all. As a triathlete whose strength is swimming, I believe that the goal of every wetsuit company should be to create a wetsuit that allows the swimmer to swim as if they didn’t have a wetsuit on. I definitely believe that’s what Huub has been able to achieve with the Agilis. 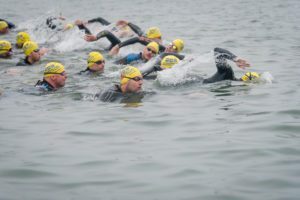 It would allow them to swim as though they weren’t wearing a wetsuit throughout the full stroke cycle. Get their hips and legs as high as possible and keep them there. To achieve these two big goals, Huub developed the Arm NeutralTM technology. Instead of adding the arms to the wetsuit by placing them alongside the trunk, they added the arms perpendicularly to the trunk. This reduces the stretch on the shoulder by half. They have also developed a new neoprene material known as the + 43TM, which improves the buoyancy by 43 per cent. This material is placed where you need it the most, which is on the hips and the legs. This helps you keep your hips and legs high in the water while keeping your trunk strong. Like all Huub wetsuits, the Agilis has the Breakaway zipper which allows you to unzip your wetsuit by simply pulling up on the cord instead of pulling down on the zipper. This may seem insignificant for someone racing Ironman races, but this type of detail matters a lot for short course races where every second counts. The Agilis is not inexpensive, but it is a much smaller investment than buying an expensive bike or wheels. If you are in the market for a new wetsuit, it is worth a try. Antoine Desroches is a sponsored HUUB triathlete.